Rent this entire two story duplex located in Michigan's Upper Peninsula just 20 minutes west of St. Ignace (near Brevort). This home offers a spectacular view of Lake Michigan's north shore. There are rudimentary stone steps leading down to the water (no beach left thanks to erosion as of 2017) on the other side of US 2, but beaches are accessible all along US2. Satellite TV and, as of 2017 season, internet is now available! This duplex is ideal for large families, or 2 small families, and offers a 2 bedroom 1st floor (1 Queen, 1 Full) with spacious living room w/sofa, comfortably sleeping up to 4 people. The second floor has 2 bedrooms (both Queen) and a spacious kitchen/living room w/Futon and will comfortably sleep up to 6. The upstairs and downstairs have separate entrances, offering both the kids and adults the privacy they desire. 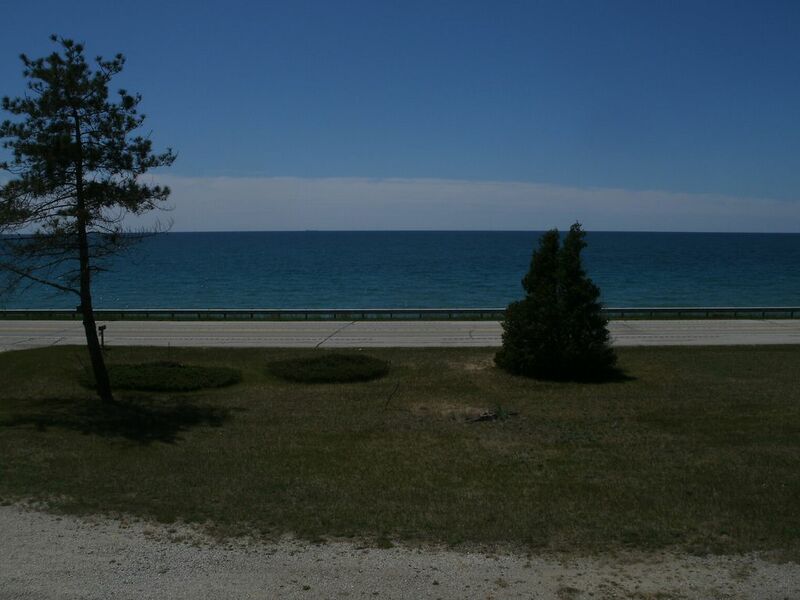 The duplex is easy to get to, located on West US 2, just 20 minutes from the Mackinac Bridge. The property is about 100 ft. back from the 2 lane highway. The highway runs adjacent to the beach, and is between the duplex and the beach. Hiking: The property abuts a vast area of state and federal forest land and offers great wilderness hiking including Switchback Ridge which is a large inland dune just 1/2 mile away. There are some majestic views from that ridge line! As well, the popular North Country Trail that stretches from New York to North Dakota can be picked up just a few miles away. There are a network of trails and 2 tracks leading through the woods so be sure to bring your compass if you plan to do any adventuring. Nearby Attractions: Nearby attractions include Mackinac Island (a ferry ride from St. Ignace), Tahquamenon Falls (1 Hr. ), Whitefish Point (1 Hr.) the Soo Locks in Sault Ste. Marie (1 Hr.). Pictured Rocks is about 2+1/2 Hrs away, but it is worth it! You can take the boat tour (though its a bit pricey) or just take in the land lover's view for free at Miners Castle. It's breath taking. If you go, don't forget to stop and stick your toes in the sand at beautiful Miners Beach - you'll see it through the woods from the lookout at Miners Castle. P.S. Don't expect a man made castle at the lookout, but it's no less impressive! The 5 hr. shoreline hike between Mosquito Falls and Chapel Rock is dazzling, but bring bug spray!! If you enjoy some occasional gambling, there are casinos in many of the 'major' cities of the UP. If you just like souvenier shopping and tasting the flavors of the local cuisine, St. Ignace will have what you are looking for. Fishing: Rent a boat or canoe (or drop in your own) in nearby Big Brevort Lake to work on a a fresh fish dinner (perch, pike, walleye, bass & panfish) for the evening. Alternately, charter a fishing boat out of St. Ignace and try your luck in the waters of Lake Michigan or Lake Huron. Fresh water, beautiful scenery out your front window, lot's of woods & hiking trails. The residence offers satellite TV and internet. Downstairs: Washer and Dryer, TV, Phone, Furnished Kitchen (Microwave, Stove, Fridge, Coffee Maker), Large Living Room with Sofa and Love Seat, Charcoal Grill for Outdoor Cooking, 3/4 Bath with Shower, Sink and Toilet. Upstairs: TV, Phone, Furnished Kitchen (Microwave, Stove, Fridge, Coffee Maker), Large Living Room with a Futon. Full bath upstairs. Bedding and Towels are provided. Excellent location and the views are stunning. The owner is very accommodating and the place is great for one family or two. Location is ideal for enjoying the best the UP has to offer! Will stay again in the future. We spent most of our time traveling around the rest of the UP, and I can say this was the perfect place to do that and still be close to the water. Between the upstairs and down, there's plenty of room. Just be aware that the only way to get upstairs is from the outside. And if you do want to hit the water, use the beach a couple miles east of the house. I believe the profile says the same. The rental was well stocked with kitchenware, towels and linens. Plenty of refrigerator space and chairs for the campfire. The view was fantastic! Very pleased to have stayed there. It’s a very nice location to stay, the best part is that the location is within hours distance to all the attractions surrounding pictured rocks. Only thing I would recommend is to bring lots mosquitoes replent cream as it’s surrounded by forest so during barbecue you will need some protection from mosquitoes. The property borders Lake Superior State Forest land. The setting is serene, and the view out the front windows of either the upstaris or downstairs is spectacular. There are a network of trails in both the State and nearby Federal forest land. Switchback Ridge hiking trail runs along a steep inland dune (pick it up approx 1/2 mile behind the duplex) and offers a scenic view across the upper peninsula. You can also see across Lake Michigan to the lower peninsula on a clear day. This is a great place to escape from it all, while still being in close range to some of the upper penninsula's most popular attractions.